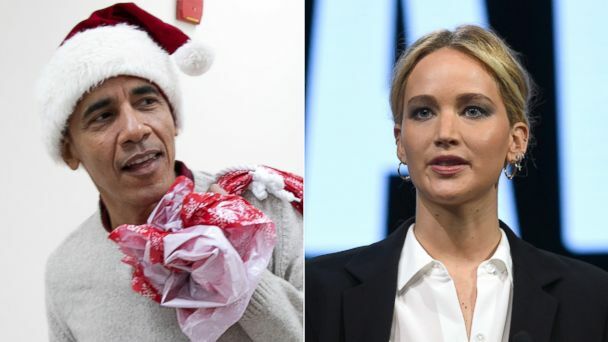 Follow the latest Christmas news, videos, and analysis from ABC News. 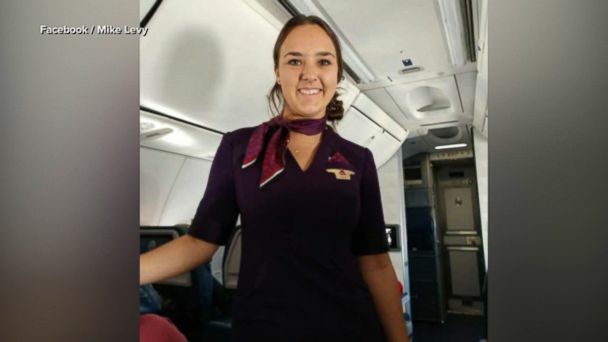 A heartwarming post of their story garnered over 100,000 reactions on Facebook. 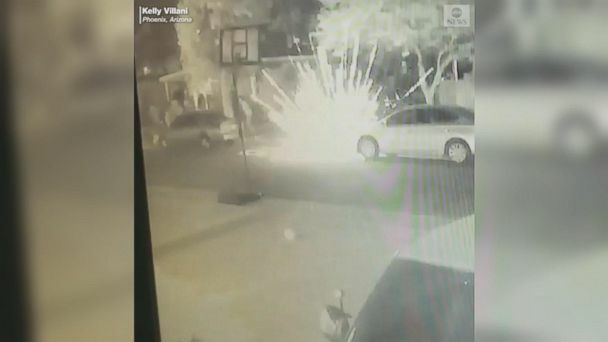 Home surveillance footage shows the moment on Christmas Eve when rocket-like fireworks were allegedly set off by members of a Phoenix, Arizona neighborhood. 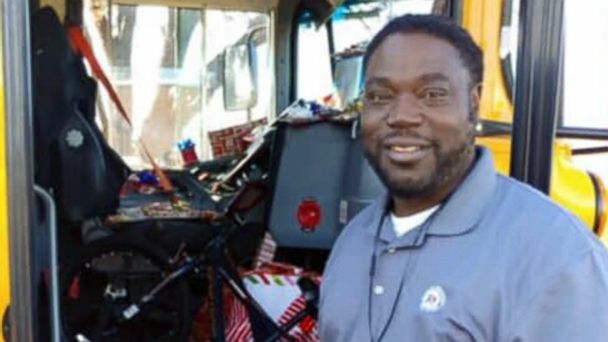 Nearly 4,000 supporters donated more than $350,000 to pay off portions of people's layaway Christmas purchases. 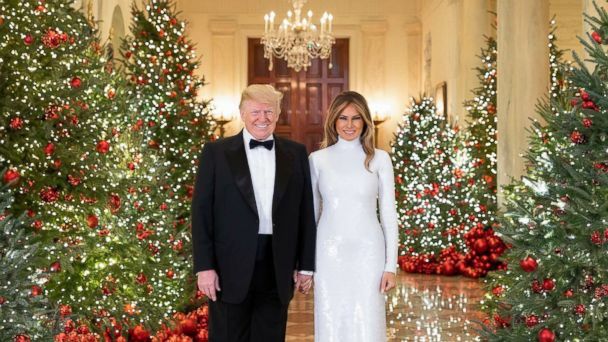 Whether it's the president and first lady or the first ladies of reality T.V., many celebrities are keeping the Christmas card tradition alive by sending well wishes. The hosts of the "Deck the Hallmark Podcast," who have watched every Hallmark holiday movie, talk about their favorites on "GMA." "GMA" goes backstage with the Rockettes during their famous Christmas show. The New York University Vocal Performance choir gives a special live performance of the beloved Christmas classic on "GMA." A guide to this year's can't-miss holiday films, from "Mary Poppins Returns" to "Aquaman." ABC News' Rebecca Jarvis shares her top tips for how to return gifts and when it is okay to re-gift a holiday present. Bishop Michael Curry, Pastor Heidi Neumark and Cardinal Timothy Dolan reflect back on the whirlwind past year on "GMA." Santa decided to use elephants instead of reindeer in Thailand for an annual school event in which elephants decorated for the occasion handed out balloons and toys to about 2,000 children. "The View" co-host shares one of her favorite classic Christmas tales on Christmas Eve for "Nightline." Did you ever want to see in person the home where Kevin McCallister outwitted the Wet Bandits? The celebrity chefs stopped by "GMA" to share some quick and easy last-minute additions to your Christmas menu. More than 3,000 people have donated over $300,000 in "GMA"'s campaign to help pay off people's holiday layaway plans. 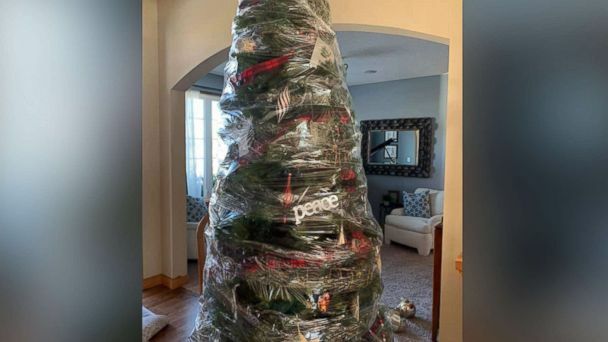 ABC News' Becky Worley shares her top tips for procrastinators on the best and most creative gift options that won't seem like they were thrown together with just hours to spare. Attention procrastinators: Here are some gifts you can put together in hours. Many stores are offering extended hours on Christmas Eve while Amazon is offering Prime members in more than 10,000 cities free same-day and one-day delivery on some orders. Approximately 134 million people are looking for deep discounts on what will be one of 2018's busiest shopping days. 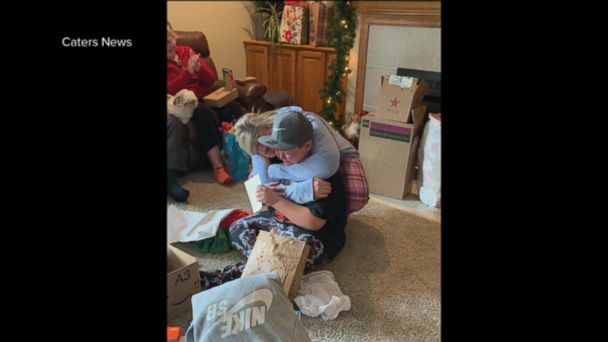 A family received a nice holiday surprise when their son, who recently enlisted in the Air Force, surprised them by coming home. ABC News' Becky Worley shares some expert tips if you're cutting it close. Make your own Santa and snowman DIY gift tags. We love these DIY gift tags a latte! Make your own DIY coffee gift tags. Add style to your gifts on a budget with these DIY glitter gift tags. Hallee Fuqua was given a surprise Christmas gift when her parents adopted a dog she'd been caring for at a shelter. Consumers share their one, made in America gift ideas with ABC News. Michael and Terri Hawthorn of Hot Springs, Arkansas, adopted 7 siblings -- Dawson, 15, Kyndal, 11, Lacey, 10, Layna, 10, Addiley, 9, Arria, 9 and Nixson, 8, on Dec. 3. Chef Christina Tosi stops by "GMA" to give us the ultimate Christmas baking lesson. 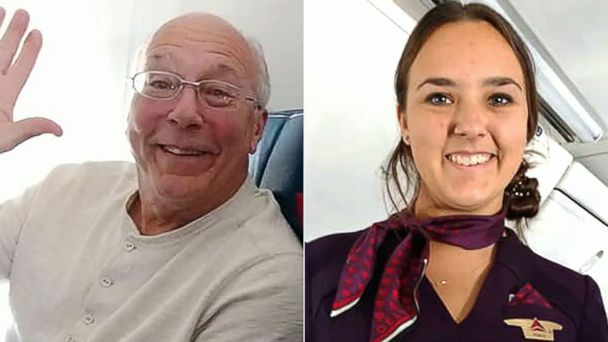 Across the country, these Secret Santa's are paying it forward by paying off layaway items so strangers can get Christmas presents for their children. Sgt. Tyler Black surprises his wife Holly and son Will live on "GMA" returning home just in time for Christmas. The editor-in-chief of Bon Appetit magazine shares holiday kitchen hacks and demonstrates how to make some fun and festive treats that are sure to be a hit at any holiday party on "GMA." "GMA" sponsor Wells Fargo updates on how many hungry people the bank was able to feed thanks to food donations from across the country to their mobile food bank. 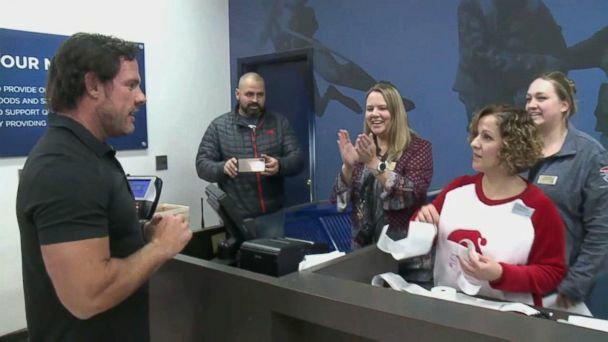 Sergeant Tyler Black surprises his family when he returns from deployment just in time for Christmas. A Texas mom has made a special letter for kids whose parents have to work on Christmas -- offering them calendar date alternatives to Dec. 25. Santa chose to rappel down a high-rise building instead of a chimney while carrying a sack of presents to deliver to kids patiently waiting in a public square in Berlin. 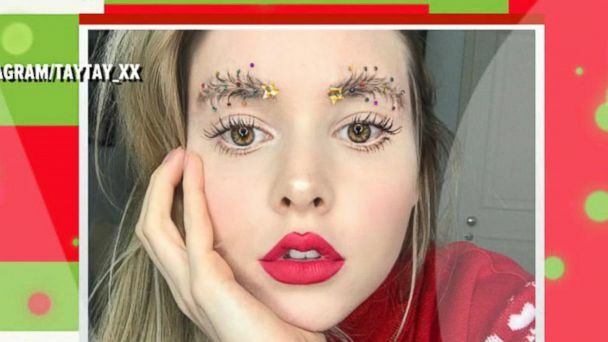 A 21-year-old baker who made a six-sided house with marzipan elves and icing railings took home the prize out of 153 participants.